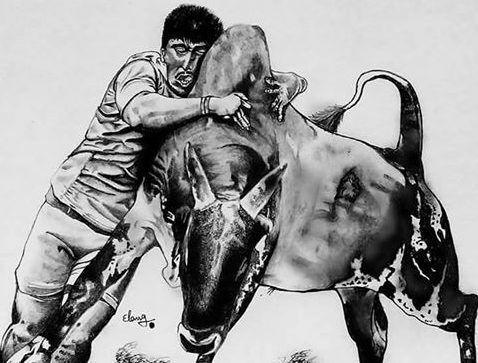 Jallikattu ban is seen as a needless interference of state machinery into our traditions by many people in India who support the sport but there is a far graver concern with this issue. And the issue is the following- Jallikattu ban is also seen by majority of Tamil population as a direct attack on Tamil customs and traditions by a non-Tamil elite. Even though the ban is being perpetrated by the brown coolie environmentalists from PETA, other NGOs and other de-racinated white wannabe liberals of Supreme court, the common man of Tamil Nadu does not see it as a fight between traditionalist/rooted Indians vs deracinated white wannabes and brown sepoys of PETA. The common man in Tamil Nadu sees it as a fight between a minority Tamil (in the context of India as a whole) vs a Hindi speaking majority elite ruling from Delhi. While they correctly view it as a direct assault on the rights and customs of Tamils, which is unconstitutional and infringing on their rights, they mistake it as an assault by Hindi majoritarian government at the centre run by BJP. This idea is put forth and advocated by the anti-national folks inside Tamil Nadu like Dravidianists, Communists and their spawns like Ambedkar Periyar association, who suddenly find that sanctity of traditions should not be infringed upon by de-racinated judges sitting in AC rooms in Delhi even though these communists all the time claim to be rationalists and anti-tradition. This intellectual dishonesty ofcourse should surprise no one as these anti-nationals have always dumped ideology for the wider anti-India goal when convenient and so this is nothing new. What however should caution other nationalists is the problem Jallikattu ban brings to the integrity of Indian Union. Many seem to forget it, but one of the ways in which west undermines their enemies is by creating division among their enemies from within, like when the British conquered India by amplifying the divisions among the various Indians states at the timd. This divide and conquer was also used very effectively by the west in the erstwhile Ottoman empire which once ruled a massive empire that stretched all the way from Balkan states in Europe to present day North Africa, Arabia, Turkey up until present day Iran. It was composed of multiple ethnic groups and religions, much like the present day India. In many ways, it was a far more inclusive government than many of the pluralist societies of present day Europe and North America. The way their government worked and the reason why they faltered and balkanised into several third rate states today from being the mighty Ottoman empire should be a case study for Hindus and Indian nationalists. The Ottoman empire at its height was the most powerful in the world unrivalled for three centuries since its beginning in 16th century to 18th century. But the later half of 19th century saw the rise of the Industrial revolution in Britain, France and rest of Europe. Ottoman empire failed to industrialise at this time and unlike Britain and France, didn’t have massive colonial possessions to loot from to enrich themselves. So Ottoman empire began to lose power in comparison to the then Colonial powers. The Ottoman empire sought to reorganise their country and reform their society and become more like Britain and France to avoid further decadence of their empire. Ottoman ruling elite attributed the success of the Britain and France to their new found enlightenment and secularism rather than attributing the reason to education and industrial revolution. While it was true that Christians at the time were far less barbaric after enlightenment, they still didn’t give up their Evangelism or their barbarity entirely. For instance, West still instituted policies of mass famines in India well after their supposed enlightenment. What enlightenment did in Europe was stopping the various sects of Christians killing each other and not stop the killing of non-Christians by them under various guise whatsoever. But Ottoman elites didn’t understand it and decided to copy the western idea of secularism whole sale, with even more vigour than the west’s supposed secularisation (for context, the secular Germany even now gives massive tax breaks and subsidies to its Churches) than learn the reason for west’s success- which was Industrialisation, exploitation of non-westerners and colonisation. Prior to the secularization of the Ottoman empire, Ottoman elites and governors came from varying backgrounds like Turks (original founders of the empire), Arabs, converted Europeans, and other ethnicities which were present in the Ottoman empire. Ottoman empire also was in control of Mecca and Medina at the time, in present day Saudi Arabia. This worked for everyone in the empire because the subjects of the Ottoman empire sought protection from the Ottoman empire from the genocidal western Christians of the time and in turn Ottoman empire was paid in taxes. Turks, Arabs and other muslims of the empire were united by the religion of Islam and Ottoman empire didn’t promote one culture over the other and saw a common enemy in West. But other than Islam, nothing was holding the empire together. So as soon as the Ottoman empire started to secularise their empire, the common thread connecting them began to disappear. Curiously enough, at the same time , nationalism was on the rise in Germany and Italy and these two countries forged new nation states from their erstwhile divided provinces and kingdoms. This was copied in Ottoman Empire too. The elites of Ottomans, who until then saw themselves as protectors of Islam and viewed Arabs, Turks and various ethnicities of the empire as equals started to promote Turkish nationalism over other ethnicities. This of course meant that other ethnicities in turn started to get more nationalistic in their own state. Up until that point, Arabs saw Ottoman empire as protectors of the Holy land from West. But with the rise in nationalism among Turks in Ottoman empire, who formed the major portion of the Ottoman elites, exclusion of non-Turks into Ottoman nobility and elites started creating alienation among Arabs and other ethnicities, also led to ride of Arab sub nationalism among Ottoman empire as a reaction to Turkish nationalism within Ottoman empire. The same people who thought Ottomans as the protectors of the holy land now saw Ottomans as the oppressors who were destroying their culture and autonomy. Before that, the common thread of Islam united these two cultures and ethnicities. But with Islam gone from the government, there was nothing left to unite them and soon, Ottoman empire decayed into various ethnic states like Arabia, which became puppets under various western states which funded and encouraged their sub-nationalism, Tunisia, Turkey, several Balkan states etc. The once mighty Ottoman Empire was reduced to nothing and once heart of Ottoman empire, Turkey became the Sickman of Europe. If one looks at the way India is being run and the thinking which goes inside the elites of this country, the similarities between India today and Ottoman Empire of yesteryears is remarkable. Hinduism is the connecting thread of India and Indian states. This is why all the separatist movements of the country happen in states with Abrahamic majority- Kashmir (not Jammu or Ladakh with Hindu and Buddhist majority respectively), Nagaland, and other North-Eastern states, often funded by the Abrahamics through mosques or churches. Even many Indians unfortunately equate western prosperity with Christianity and secularism while in fact that never was the case. Western success was borne out of loot (which can to a large extend be indeed attributed to Christianity) and Industrialisation, not because of the made up secularism. Even now, western countries are far more supportive of their churches than India is of its temples, like the numerous tax breaks USA gives to Churches and Subsidies which German government gives for its Churches, while Indian government loots Hindu Temple money to fund holiday packages for Muslims and Christians to visit Mecca and Jerusalem. So secularising the government and society further is not going to magically make the country better or more prosperous as most brainwashed white wannabe Hollywood watching Indians who take their morality from Brothelwood thinks. By secularising our society and destroying the common thread of Hinduism, what we would end up doing is killing the only connecting thread of the Indian civilisation. There is a massive advantage to being a united country- strength in numbers, large markets, large labor force, easier copying and combining of great ideas which crops up from huge population, lower percentage of men and resources needed to protect the nation from external enemies etc. The disadvantage of course is that one might lose their autonomy over their own lives. This was the reason states were formed and were given large autonomy for the various ethnic and language groups inside their states, to prevent this negative effect of this multicultural multi-language country. A Tamil in South Tamil Nadu has nothing whatsoever in common with a Punjabi in North-West India, except for the fact that both are polytheists and believe in Hindu gods and respect each other’s customs enough to not poke nose into each other’s issues. Both Tamils and Punjabis get huge benefits by being in a unified India, the Hindu state, where the Hindu state takes their taxes and in turn provides protection from external enemies, provide equal opportunity to be part of that governing body while allowing them to live in their own ways so long as they do not disturb others. There is no negative in having such a union whatsoever so long as the autonomy of the constituents are not disturbed unreasonably (with the term unreasonable being subjective to the Tamils/Punjabis and not de-racinated white wannabe libtards). But when the cultural autonomy of the Tamils or Punjabis is disturbed, then there is a very important reason for them to rethink their commitment to the central state. Now the benefits of the Union are being pitted against the loss of their culture, language and tradition. And unsurprisingly, the only times there were massive unrest and talk of separatism in these regions were when the central government threatened their respective cultures (Hindi imposition in case of Tamil Nadu and Khalistan insurgency where Indira played with Sikh extremists against Akalis in Punjab). Now the Jallikattu ban follows along the same path as that of the Hindi Imposition. Unsurprisingly enough, calls for separate Tamil Nadu, something long dead since 1967 when Central government came to its senses and decided to scrap Hindi imposition plan, is at an all time high now and is being revived. The local media in Tamil Nadu is still largely rooted and hence is in fierce support of the local traditions, unlike the white wannabe liberal sepoys of English media. And all that local media does is hype up the anti-centre message as they too see the assault on Jallikattu as a Hindi/Centre vs a Tamil issue. Of course this is not true, as all Hindu nationalists, regardless of their language support Jallikattu as a tradition and this is a fight between rooted traditionalist Hindus vs de-racinated white wannabe HINOs. But this won’t matter to consumers of news in Tamil Nadu who too increasingly see this as a Tamil vs Hindi issue. The fact that this issue is being pushed forward by the snakes inside the Modi government like Menaka Gandhi does not help the central government either. Of course, often in the discussion of this issue, one easily forgets that if not for the different religion, there is nothing different between Pakistan along with its four different provinces, Bangladesh(.ie East Bengal) and India. The former two speak the Indic languages and follow the same culture as the Indians and yet are in no way compatible with Indian union. The only difference is that the former two are of muslim majority while India has a Hindu majority. Hinduism is the thread which connects various states, ethnicities and cultures of India. By secularising our traditions like Pongal and banning festivals like Jallikattu based on some hypocritical white wannabe morality of eating “Halal beef” while banning Jallikattu is destroying our own connecting thread for no reason than earning brownie points from white libtards of the world. The brown sepoys of PETA, scroll.in are at least being paid crores of rupees for pimping their country to their western masters to ban Hindu traditionalist sports like Jallikattu. They would sell even their mothers for a few extra shekels and ideology, but why should self-respecting normal Hindus support such actions against their traditions, specially when they have so much to lose from it, including their potential freedom and culture? Just as a reminder, Pakistan tried doing the same cultural imposition with imposition of Urdu on Bengal which led to the creation of Bangladesh in 1971. The same is now being done in Balochistan and will lead to collapse of Pakistan into various states in Pakistan too. The question is, are Indians willing to learn from their past mistakes or mistakes of their ancestors? Or do they want to play with fire and balkanise the country into various states ripe for third wave of colonisation and conquest by unmattas and marunmattas? Jallikattu ban may seem like a non-issue to nationalists and others outside Tamil Nadu, but the deeper meaning and impacts of such self-harming actions will cause a huge problem for the state of the union and the future of our country. Read this for understanding these issues better.